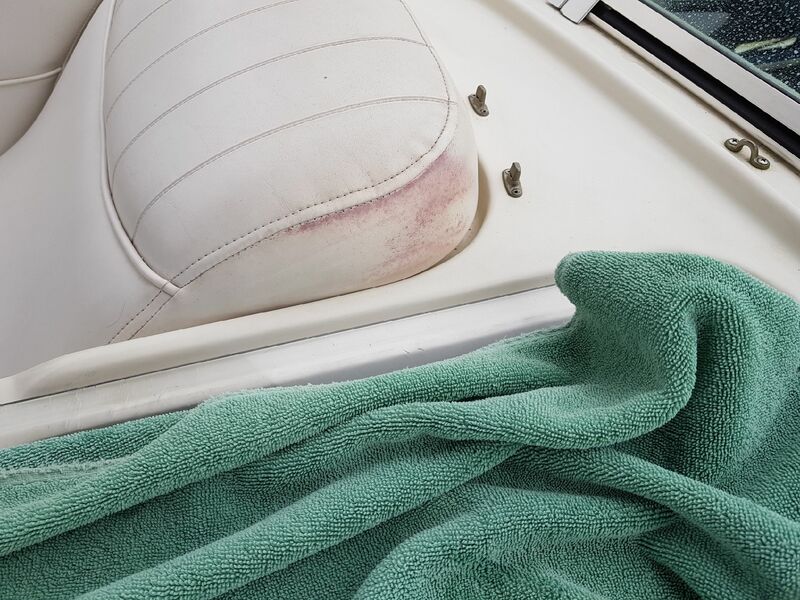 PinkAway™ Home Solution is a permanent solution for Pinking on your boat’s vinyl cushions. 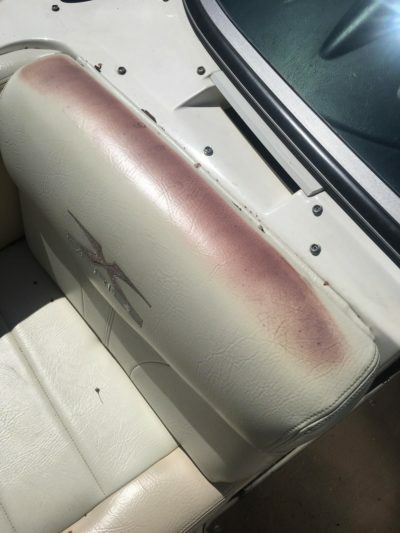 Traditional cleaning products are ineffective against Pinking but the Home Solution agent goes all the way through the vinyl and harnesses the power of the sun to eliminate Pinking. 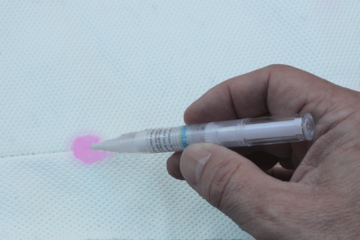 The Home Solution consists of an innovative, self-contained cartridge which holds a patented chemical agent and is so easy to use that you can permanently eliminate your Pinking by simply applying five coats in direct sunlight. It’s that simple. 100% Money Back Guarantee – Free Test Cartridge in Every Order! PinkAway Home Solution comes with a 100% money back guarantee. 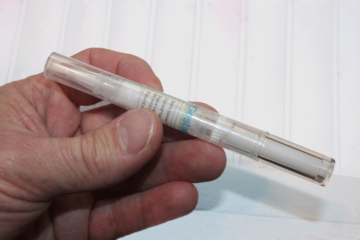 All of our kits ship with a free test cartridge. 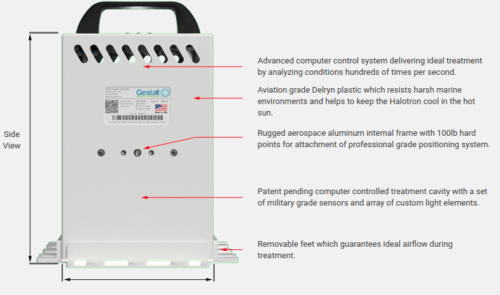 If the Home Solution test cartridge doesn’t work to your satisfaction, for any reason, then we will refund your purchase. 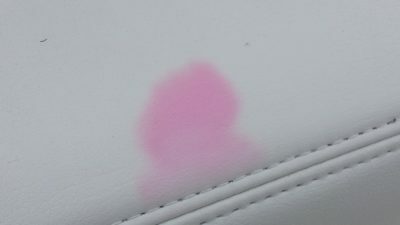 The PinkAway Home Solution product is primarily effective against bacterial pinking but there is another type of pinking called “chemical pinking”. 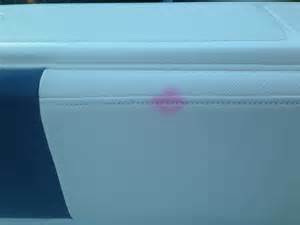 The PinkAway Home solution is not effective against Chemical Pinking which can be mistaken for bacterial pinking.  Please confirm you have bacterial pinking before ordering by looking at the images below. 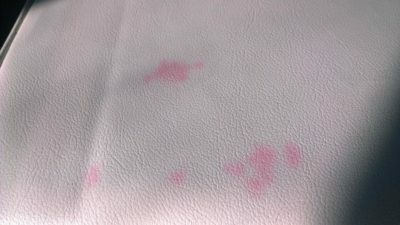 These pictures will show both chemical and bacterial pinking. 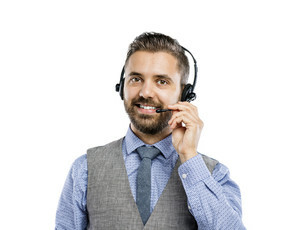 If you have any questions about which you have you can send pictures of your cushions to our support staff and we will diagnose it for you. Bacterial pinking comes from the metabolic process of bacteria forming inside the cushion. 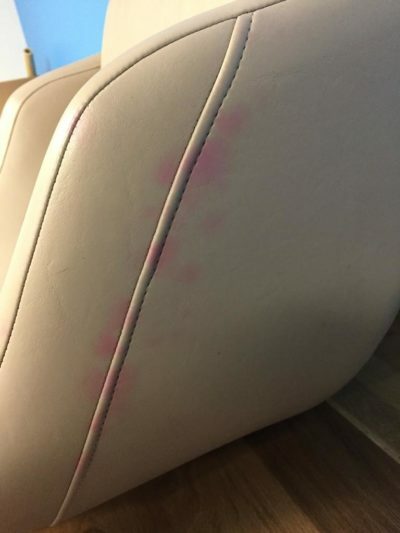 Is is usually found near seams of the cushion and are a brighter pink in color normally emanating from circular concentrated concentrations of the bacteria which results in the stains appearing as spots or circular patterns of pinking. 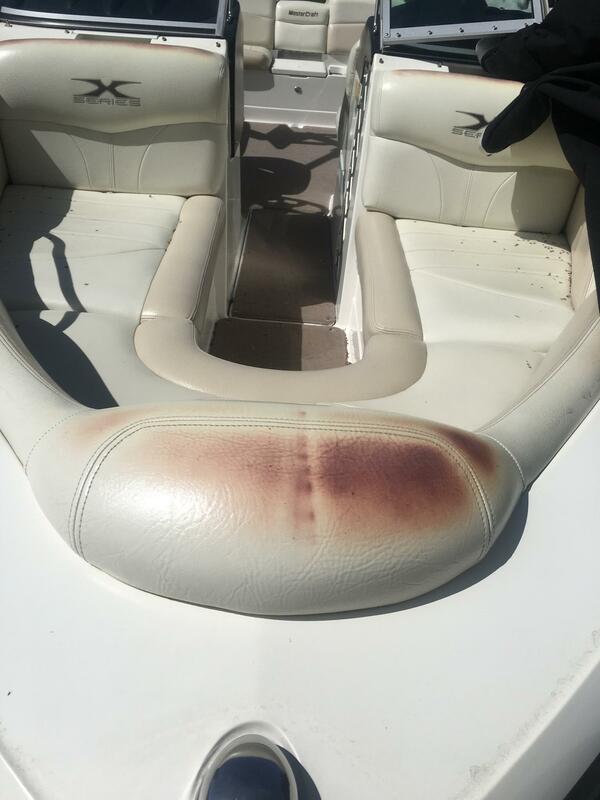 Chemical Pinking is caused by the byproducts from various adhesives and other products used in the construction of marine vinyl cushions. 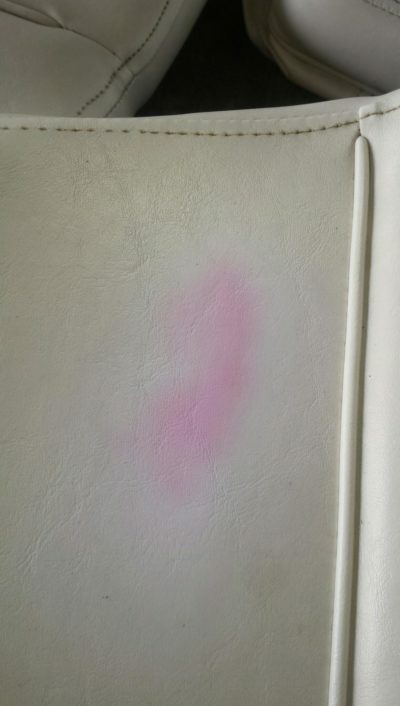 Chemical pinking can come and go over short periods of time and is aggravated by hot or warm conditions. 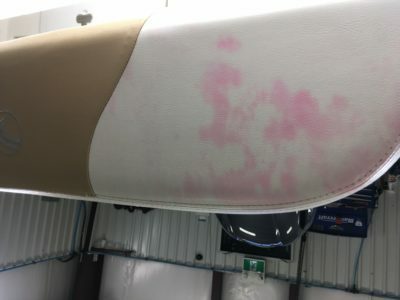 Chemical pinking can often appear to be a crimson or dark pink, red, maroon or blood red color which can cover large areas of the cushion and can often exhibit regular patterns from the gluing process. Before you order the PinkAway Home Solution you need to estimate the total area of Pinking on all of your boat’s cushions. The best way to do this is by using a US Quarter, or similar sized coin, as a tool to help you estimate the amount of Pinking you have. By either actually superimposing the quarter over the stain and moving it around or even just in your minds eye doing the same you can get a close approximation of the stained area by counting up how many quarters would cover the stained area. 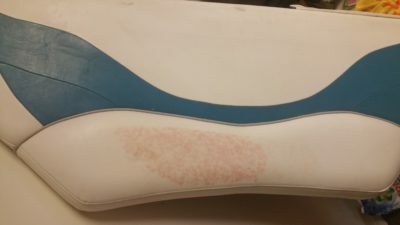 When doing this make sure to provide a slight overlap around the stain because the treatment of the stain must be slightly larger than the visible area.